Alan Rupe is the managing partner in the Wichita and Kansas City offices and vice-chair of the Labor & Employment Practice. Mr. Rupe is a trial lawyer whose demonstration of special knowledge, skills, and proficiency in civil trials has earned him the title of “Board Certified Trial Specialist,” certified by the National Board of Trial Advocacy. He also maintains the Martindale-Hubbell ® AV Preeminent ™ Rating. 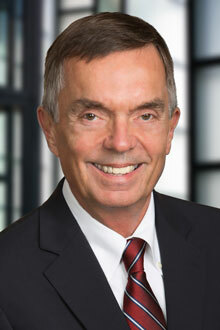 Mr. Rupe is an experienced trial lawyer, well versed in EEOC and civil rights complaints at a federal level. Recent peer reviews describe him as "brilliant," and note that "he has tried a ton of lawsuits and understands as well as anyone how the courtroom works. He's tough but easy to get along with. One of the best." Mr. Rupe is also an “Advocate” member of the American Board of Trial Advocates (“ABOTA”). “Advocate” membership is by invitation only and granted only to those trial attorneys who are of “high personal character and honorable reputation” with considerable jury trial experience. Mr. Rupe’s practice embraces every aspect of employment law: day-to-day counseling, training, administrative agency proceedings, civil litigation, and trials. His years of experience defending claims of discrimination, retaliation, wrongful termination, civil rights violations, and wage and hour class and collective actions, cause employers to seek him out for representation in state and federal courts across the United States. Mr. Rupe receives ongoing national attention and recognition for his successful prosecution of cases relating to the constitutionality of the funding of K-12 public education. Mr. Rupe received the Demetrio Rodriguez Champion of Educational Justice Award, awarded by Education Law Center, Inc. for "years of outstanding lawyering and lobbying and perseverance in the face of many obstacles, including brash insults" for his work on a series of lawsuits on behalf of Kansas school children. The lawsuit culminated in a court ordering the State of Kansas to increase spending on public schools by nearly $1 billion each year from 2006-2009, and approximately $440 million in 2014 and 2015. With over 43 years’ experience practicing law and litigating cases, Rupe has experience in virtually every aspect of insurance law, including professional liability, general liability, construction litigation, and public entity defense. Oral argument and advocacy are two of Mr. Rupe’s strengths; he is often retained to handle appellate arguments after previous counsel receives unfavorable rulings or verdicts by trial courts. As an ABOTA “Advocate,” Rupe has significant jury trial experience as lead counsel in well over 150 jury trials. There is virtually no type of civil matter that he has not handled in the courtroom. He tried the first Title VII jury trial in Kansas. He tried school shooter cases. He tried the first RICO case in Kansas. He has litigated a number of single plaintiff, class, and collective action lawsuits involving nearly every dispute imaginable in state and federal courts across the country, from Montgomery County, Maryland to Los Angeles Superior Court to Minneapolis, Minnesota, to the Eastern District of Pennsylvania, to Brownsville, Texas. Accustomed to being the “lawyer from out of town,” he associated with local counsel and skillfully and successfully demonstrates his courtroom skills and experience on behalf of his clients. Mr. Rupe shares his legal knowledge and know-how through public speaking and writing. He speaks frequently to executives, lawyers and human resource professionals on a variety of workplace and legal issues. He teaches trial lawyers trial tactics and strategy. He is a contributing author to Defense Research Institute publications, the Kansas Bar Association’s Employment Law Handbook and Annual Survey of Law, and contributes regularly to other legal and human resources publications. Obtained decertification of a company-wide collective action, initially certified pursuant to Section 216(b) of the Fair Labor Standards Act, in a federal lawsuit in which contractors that delivered cargo in their personal vehicles contended they were misclassified and should have received overtime compensation. Defeated class certification in federal court lawsuit in which the plaintiff contended that revisions to a public school district’s retirement benefits deprived her of a contractual right to substantial benefits upon early retirement. Obtained judgment in excess of $91,000,000 on behalf of client, who manufactures automobile engine additives, against former foreign distributor who affixed client’s trademarks on counterfeit products sold in China and other countries in Southeast Asia. Won summary judgment, and affirmance by the U.S. Court of Appeals for the Eighth Circuit, in disability discrimination case in which the plaintiff, whose eyesight did not allow him to pass DOT certification standards yet who claimed he never drove commercial vehicles, was required to drive commercial vehicles as an essential function of his position. Won summary judgment in commercial litigation case in which the plaintiff sought over $2 million in lost profit damages following client’s allegedly wrongful repossession of equipment, yet failed to disclose the claim on his schedules in his pending bankruptcy. The Court found that the plaintiff was judicially estopped from pursuing a claim not disclosed to the bankruptcy court. Obtained numerous dispositive rulings in clients’ favor on summary judgment, motions to dismiss, and appeal, in cases alleging employment discrimination, harassment, retaliation, FMLA interference, common law wrongful discharge, and wage and hour violations. Obtained numerous dispositive rulings in clients’ favor on summary judgment, motions to dismiss, and appeal, in cases alleging various violations of federal civil rights. Obtained numerous “no probable cause” findings in proceedings before the U.S. Equal Employment Opportunity Commission or counterpart state agencies. "Examining Damages In ADEA Retaliation Claims," Law360, June 2017. “Using the Intricacies of ERISA for Litigation Success,” Law360, August 2016. “We’ll Tell You What to Include in Severance Agreements…and Then We’ll Sue You for It,” For the Defense, January 2015. “U.S. Supreme Court Clarifies the Plaintiff’s Burden of Proof in Title VII Retaliation Actions,” Kansas Bar Association, January 2014. “What I Learned at the Movies,” American Bar Association’s Employment & Labor Relations Law, Fall 2009. “For Every Class Action, There is an Equal and Opposite Reaction,” Defense Research Institute, September 2009. “Lassoing the Wind – Selected Issues in Managing a Class or Collective Action Defense,” Commercial and Intellectual Property Litigation Symposium, April 2009. “To Talk, or Not to Talk…That is the Question: Communications with Potential Class Members,” Defense Research Institute, June 2008. “Meet the Bosses Who Could Win the Awful,” Workforce Magazine, February 2008. “Weeding Out the Passive-Aggressive, the Liar and the Blamer,” Workforce Magazine, January 2008.